Customize up to 300 color glossy pages in our disaster books … for FREE! Yes … you read that right. Our upgrade option now allows agencies, businesses and organizations to add up to 288 extra color glossy pages in our IT’S A DISASTER! books for a total of 300 customizable pages..! Our regular 266-page manual provides tips on what people should think about and do before, during and after specific types of emergencies and disasters, as well as how to administer basic first aid. 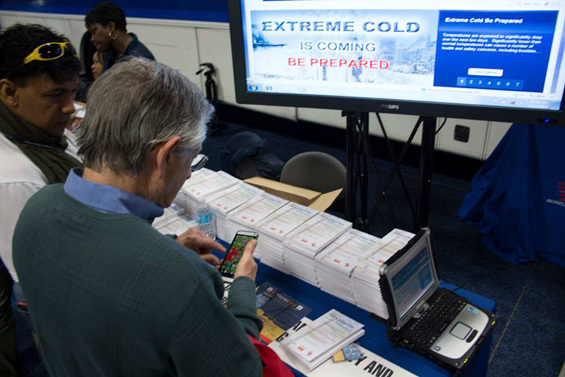 Both the public and private sectors have been using our preparedness books (and ebooks, CDs and flash drives) for volunteers, employees, customers and local communities since 1999. We customize books in the print process on 1,000 unit (& larger) orders and the covers and first 12 pages can be personalized at no additional charge. And if you want 48 to 288 extra full color glossy pages, the upgrade price is $7.00 U.S. each and includes free customization and free freight within 48 contiguous U.S. states. FEMA believes that every community benefits from public-private collaboration in emergency management, and our company’s products are perfect Public Private Partnership tools. Groups can partner with local Chambers, Rotary Clubs, Local Emergency Planning Committees, UASIs, VOADs, grocery, discount and hardware stores and others … and encourage them to place full color ads inside books for day to day goods and services. Consider collecting ridiculously LOW prices to advertise and remind advertisers and sponsors that books will STAY in the home year round (unlike many other forms of print advertising). And, if paperbacks are filled with coupons, QR codes and savings on things like groceries, preparedness supplies, lawn care, haircuts, dry cleaning and more, the public (and advertisers) will look forward to new versions of the book year after year. The goal is to use this customized “tool” to encourage and incentivize people to keep your custom book around so they will constantly reference the data. A great way to do that is to fill the paperback full of coupons and savings on every day products and services from your local partners. Basically we are “buying the public’s engagement” while helping whole communities prepare for the unexpected, plus it’s a great way for groups to raise funds. Give books to schools, Scouts, volunteer groups, etc. to help disseminate materials. Use the color glossy pages to build and expand public-private partnerships and offer coupons and savings to motivate and engage the public while raising funds for volunteers or projects. Total funds leftover for nonprofit/CERT = $33,000 … and more funds could be raised by collecting more per ad or offering premium placement on outside color covers, inside covers, use some more color pages for ads, etc. Total funds leftover for Region/Assoc/Rotary = $1,090,000 … and more funds could be raised by collecting more per ad or offering premium placement on outside color covers, inside covers, use more pages for ads, etc. Note: A $5,000 ad is only 10 cents per book that goes into 50,000 homes..! That’s cheaper than a postcard … plus a 576 page book STAYS around. Please realize we have to bundle 1,000 unit & up custom jobs together and print minimum 20,000 books at a time several times a year. Also … we can do multiple versions of books for projects (1,000 & up per version) so you can customize covers and pages by area, county, division, agency, etc. NOTE: We are doing a custom print early August so books are ready for National Preparedness Month. And remember, in small quantities and on rush orders we can always customize our “standard” red books with free peel and stick labels. Download a 2-page PDF overview with a few examples, learn more about this creative PPP tool … or call Fedhealth at 1-888-999-4325 to discuss your needs. You are currently browsing the Fedhealth blog blog archives for July, 2014.